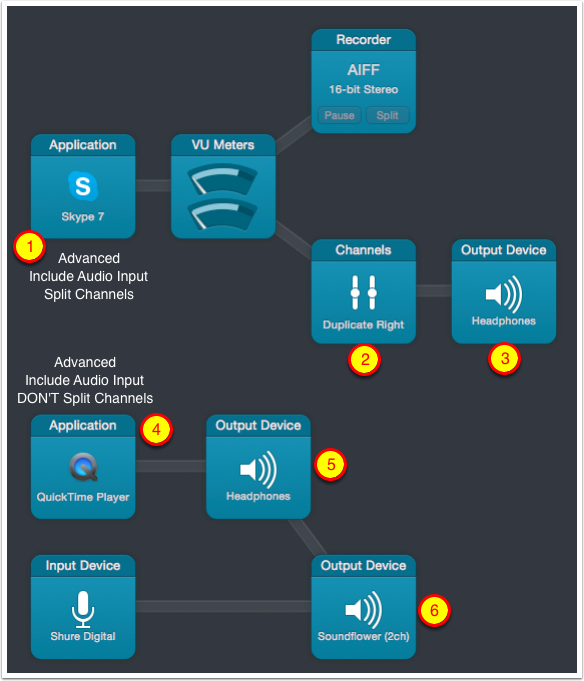 This tutorial explains how to use Rogue Amoeba’s Audio Hijack 3 (http://rogueamoeba.com) to capture both sides of a Skype call to separate channels and also include high quality sound coming from an iOS device plugged into a Mac. This technique can be used to capture music, podcasts, games, VoiceOver, any sound coming from an iOS device. Heck, you could even record audio from a phone call coming from your iOS device with this technique. 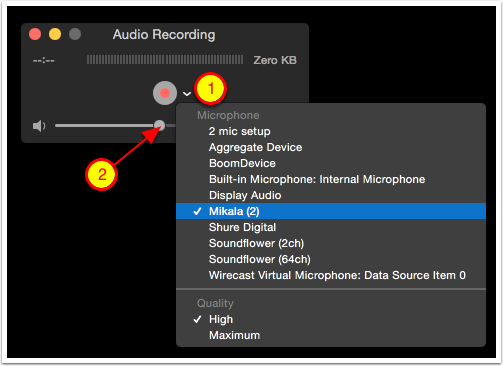 Overview: We’re going to use QuickTime to capture the audio from the iPhone, and we’ll combine it with our microphone using Soundflower (2ch) via Audio Hijack. 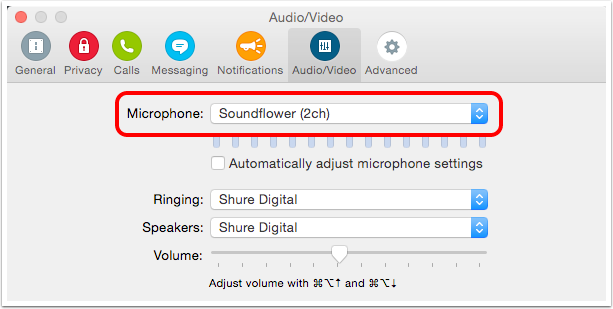 We’ll use Soundflower (2ch) as the audio input to Skype. 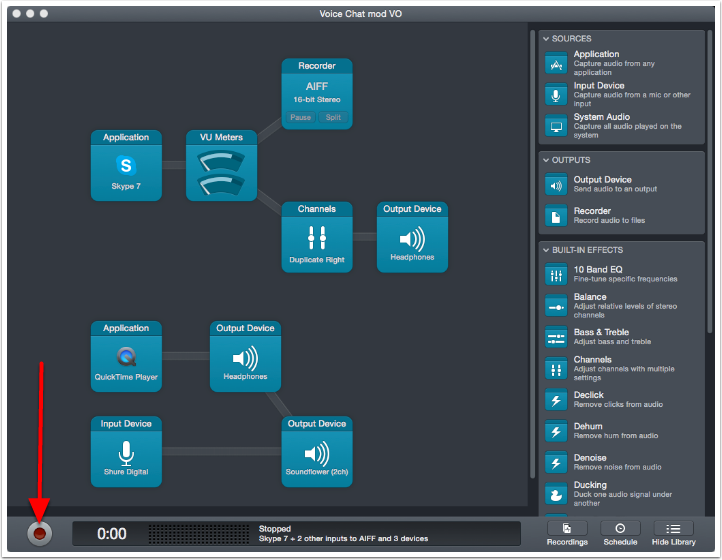 Then we’ll set up a stereo recording in Audio Hijack so that we can hear the caller but not our own voice. Plug the iOS device into the Mac via Lightning/USB cable. Launch QuickTime and select File/New Audio Recording. The volume slider will be muted, drag it up to around half way. You will need to experiment with this volume when you get your caller online. QuickTime Player is the virtual mic for my iPhone speaking in VoiceOver. We do need the audio input but no need to split channels as it’s mono. Set the Microphone input to Soundflower (2ch). NOTE: As soon as you change the mic input to Soundflower, the other person on Skype cannot hear until you hit record in Audio Hijack. Included a little screenshot of Audacity showing that this setup successfully captured me and my iPhone on one channel and the Skype caller on the other channel.